The waxes on this page are all natural products. Please expect variations from season to season and batch to batch. It is very important that you always do a small test batch. Store the wax out of sunlight, in dry conditions, at room temperatures. 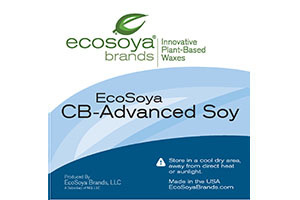 NGI have re-introduced the EcoSoya CB-Advanced it is made from pure 100% soybeans and carefully selected botanical oils. It has a very smooth appearance, with an even burn pool, and consistent color retention. It works great with dyes, and is highly frost resistant. It contracts slightly from the container, producing a beautiful looking candle. Good hot and cold scent throw. Now comes in small beads; please test a small amount. To keep your candle 100% natural use our natural waxed wick. 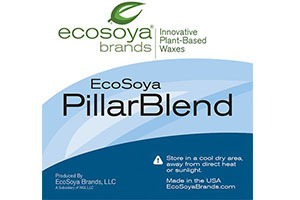 NGI have re-introduced the EcoSoya Pillar Blend. A natural candle wax used to make natural pillar and votive candles. The wax contracts from the moulds to enable easy mould release. You will need to do two to three pours to fill the void left from contraction. Gives you a beautiful smooth creamy finish. As with all our natural soy wax it is ready to use out of the box, just add dye and fragrance if required. Now comes in small beads; please test a small amount. To keep your candle 100% natural use our natural waxed wick. Visit the website of the makers of EcoSoya wax. Help for beginners to candle making to choose a wax.